ERA Realty Network, a Singapore-listed real estate agency, announced a grant of $1 million as a start-up capital to subsidise the joining fees for new real estate agents joining the industry. The grant was announced on Friday (22 March 2019) at ERA’s Open Day, where new agents were given the opportunity to try out the new online submission system, iJoinERA. 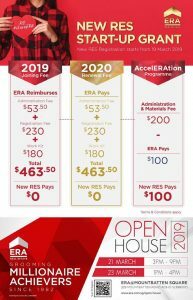 With the grant, new real estate agents joining ERA pay only S$100 for administrative and material expenses, instead of the usual S$1,127. Additional $100 subsidy for its mandatory Skills training programme, which costs $200. Good property agents need to talk less, talk sense and only talk when needed, but yet be able to build the relationship with the buyer of a property or for the home owner seller the property. The property agent also needs to listen to what their customer needs, rather than what they want the home buyers to buy or the price they want the seller to sell. Some emotions are expected, but a good agent should be moderate in emotions and should not create the emotional rush to buy or sell a property. ERA has created a site called Find Property Agent where you can find Good Property Agents as they will try to monitor agent’s performance carefully, you can try it out. The grant by ERA for new real estate agents comes at a time when the industry, which is already overcrowded, faces stiff competition by automation. Agents who do not understand how to make technology work for them and help set them apart from the competition, are dropping out. Paul Ho, chief mortgage consultant at iCompareLoan, in welcoming the grant for new real estate agents by ERA said: “the grant is especially useful for the agents to learn and upgrade their skills. In this very competitive environment, any agent who does not upgrade his skills will surely ‘die'”. “Agents and financial advisors must use technology to their advantage, to beat the competition and be seen and heard in this increasingly information-polluted market atmosphere,” he added. This is where tools like iCompareLoan.com’s Home Loan Report are useful. Agents who make use of this user-friendly technology are able to augment their services. The Home Loan Report tool is a Singapore’s first one-of-a-kind analysis platform that provides latest updates of detailed loan packages and helps property agents, financial advisors and mortgage brokers to analyse home loan packages for their clients and give unbiased home loan / commercial loan analysis for their property buyers and home owners. As buyers of the future grow more discerning, agents cannot afford to just rely on their personality or their experience to attract clients. Buyers and sellers of the future will increasingly rely on agents to have knowledge on property finance calculations and this is where the Home Loan report comes in. This trademarked tool is a one-stop solution that can help deliver a detailed home loan report to property agents in 3 minutes flat. This is especially helpful when agents who do not have knowledge on property finance calculations make cold calls to potential clients and need to have a thorough analysis at hand in order to best direct each client on what their property buying and selling options are. Such a report will not only help agents deliver the best possible property options to their clients, it will also help prevent the agent or potential buyers or sellers from wasting each other’s time since they already have all the information they need on the potential client’s buying or selling prospects at hand. Mr Ho asserted that property agents who want to continue working in the industry must set themselves apart and position themselves as thought leaders, especially in this day and age where digital marketing largely drives the economy. “It’s not a science, it’s a soft art,” he said, explaining how simply organising content online, maximising contacts using platforms like LinkedIn, creating simple webpages and adhering by SEO principles can help agents become sought after without extraordinary effort. “Not only new real estate agents, but all property consultants must know how to throw a well-equipped hook into the sea and wait for the bait which will surely arrive,” Mr Ho said.